What happens when you drop an amnesiac teenage boy into the middle of a bustling Japanese fashion district to fight for his life in an erase-or-be-erased tag-team action RPG? You get a wonderful world of characters, enemies, art, and music that will captivate you for hours and hours of play. The World Ends With You originally debuted on the Nintendo DS in Japan as It’s a Wonderful World and later found its way to the rest of the world. TWEWY initially got a quiet reception but has gained somewhat of a cult following over the years further bolstered by a mobile port by the name of Solo Remix. Those few who happened upon the game were captivated by its charming characters, unique art, and deep plot lines. Now back and better than ever, The World Ends With You: Final Remix has appeared on Switch with a beautiful graphical overhaul and all-new story threads that help wrap up this final version of the game. Final Remix takes mechanics from its mobile Solo edition and re-injects the charm of the dual screen 2-character control system of the original creating the ultimate TWEWY experience. You begin as Neku, a why-should-I-care teen boy with no memory of his past and no idea why strange monsters are attacking him, or why he’s seemingly invisible to everyone else. He reluctantly teams up with a person who can see him, showing him how to fight the “Noise” monsters. Together Neku and the new friends he meets along the way battle to survive waves of Noise and Noise-summoning reaper characters to make it to the end of this deadly game they find themselves in. 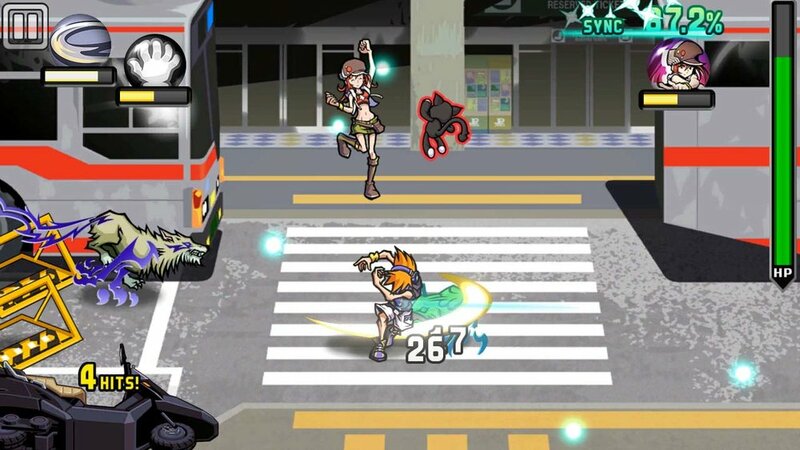 TWEWY offers motion pointer controls, touch screen controls, 2-player co-op, and 2-player single-op features. You navigate the overworld sections of Shibuya by dragging and tapping locations on the screen, interacting with various NPCs. Touch controls feel spot-on and motion pointer controls work way better than I expected. You can also tap a pin to scan your environment to read NPC minds to gather clues to solve Neku’s memory problem. In combat, modern action RPG elements have you controlling 2 characters at once performing various swipe, tap, and dragging motions to activate abilities and attacks to defeat Noise. Final Remix takes much the same steps as its prior two versions to ease players into the action and story of the game with tutorials woven into the story but never too long or boring. This is a text-heavy game and the story quests seem to last for ages but the game’s cast of characters help to break the monotony of backtracking and wandering around a bustling Shibuya. The original story line has remained unaltered only adding an extra story arc to expand the world and set up a sequel in the final remixed content of the game. Game mechanics retain much of its Solo Remix operations but with the added motion pointer for docked mode and 2-player options to shake up the formula and re-implement the ability to control both partners at once with a single Joy-Con representing each player. Difficulty level can be set to 4 modes with a level slider within each difficulty to add more or less challenge to the game at the cost of increased/decreased item drop rates. RPG fans can enjoy the fun of leveling up and evolving their pins while casual players can find fun in collecting pins to use in the Tin Pin mini game and shopping for clothing in the in-game stores. Completionists are rewarded for their perseverance too, with hidden Noise reports that take deep cuts into the backstory and lore of the world. The Final Mix content is a great addition to the game, bringing a new threat and a remixed Shibuya, as well as paving the way for a potential sequel. The HD art improvement in this game is incredibly impressive, and the clothing and pin designs offer quite a diverse look into the fashion trends of Japan. The World Ends With You: Final Remix is the definitive experience for newcomers and veterans alike. The game looks amazing in HD when docked, and is equally impressive when played on the Switch’s smaller screen. The main game took me roughly 40 hours to complete and offers even more gameplay for those who want to see all the game has to offer - with two post-game story arcs and challenges you can complete by revisiting the main game. Whether you love all things Japan, are easily drawn into emotional stories, or just simply enjoy a creative art and music, this game is for you.